Artists Luca Antonucci & Carissa Potter, owner-operators of San Francisco’s Colpa Press and Edicola Newsstand, will appear in the Kala Gallery Saturday, December 15, to discuss their recent projects and collaborative history. For the past two years, Colpa Press has dedicated itself to challenging the independent publishing community by producing work that examines the print form in the age of digital media. Its publications investigate the relationship between printmaking and concept; every production decision is motivated by this dialogue. As Colpa Press, Antonucci and Potter also curate site-specific events that address the history of the location as well as the future of re-purposing these spaces. 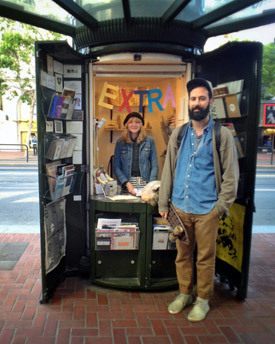 In March of 2012, Colpa Press opened Edicola, a re-purposed newsstand/kiosk on San Francisco’s Market Street, selling artist books, fine art prints, independently published periodicals, and records. To date, Colpa has brought over 100 artists to the kiosk and hosted and/or curated over a dozen events on Market Street and other venues. Recent recipients of the 2012 Alternative Exposure grant, Colpa plans to continue expanding its line of art books, and to open new and unusual venues for their distribution. Luca Antonucci is interested in the way space is defined, in both public and literary terms. His work is often a re-negotiating of historical incidents from the perspective of varying technical faculties. | Carissa Potter‘s practice is a careful investigation of intimacy both publicly and privately. Carissa’s prints and small-scale objects are meant to integrate into retail environments and point to the hopeless romanticism of consumer products.